Deputy Governor H.E. 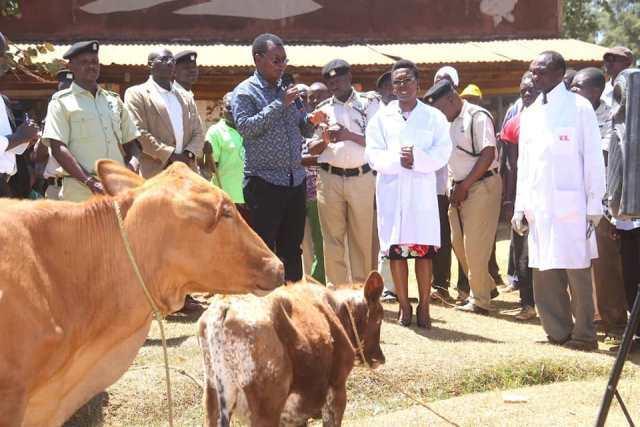 Prof. Philip Museve Kutima today launched a vaccination campaign targetting cattle, dogs and cats across the county. The exercise, fully sponsored by the county government of Kakamega, targets animals in each household and will run until 6th February 2019. Speaking at Matete market grounds, Chevaywa ward, Lugari sub county, the deputy governor who doubles up as the CECM for Agriculture, Livestock Production, Fisheries development and Cooperatives said his ministry is moving with speed to prevent spread of animal diseases in the county through the campaign. Some of the diseases targeted for vaccination include foot and mouth in cattle as well as rabies in dogs. “I would like to urge everyone who owns a cow, a dog or a cow to present them for this free vaccination exercise against various diseases,” he said. The deputy governor called on farmers to engage in dairy farming and poultry rearing as a way of diversification. He announced that supply of farm inputs; fertiliser and maize, in every sub county at a subsidised cost will commence soon and called on farmers to register for the inputs as they prepare for the upcoming planting season. In attendance was Chief Officer Dr. Kelly Nelima, Members of County Assembly, Directors, Heads of Departments as well as ward and sub county administrators among others.